This antibody detects a region about 40AA before the MH2 region (not the MH2 region itself). Synthetic peptide within Human Smad2 aa 200-300. The exact sequence is proprietary. Our Abpromise guarantee covers the use of ab33875 in the following tested applications. WB 1/1000 - 1/2000. Detects a band of approximately 58 kDa (predicted molecular weight: 58 kDa). Receptor-regulated SMAD (R-SMAD) that is an intracellular signal transducer and transcriptional modulator activated by TGF-beta (transforming growth factor) and activin type 1 receptor kinases. Binds the TRE element in the promoter region of many genes that are regulated by TGF-beta and, on formation of the SMAD2/SMAD4 complex, activates transcription. May act as a tumor suppressor in colorectal carcinoma. Expressed at high levels in skeletal muscle, heart and placenta. Phosphorylated on one or several of Thr-220, Ser-245, Ser-250, and Ser-255. In response to TGF-beta, phosphorylated on Ser-465/467 by TGF-beta and activin type 1 receptor kinases. Able to interact with SMURF2 when phosphorylated on Ser-465/467, recruiting other proteins, such as SNON, for degradation. In response to decorin, the naturally occurring inhibitor of TGF-beta signaling, phosphorylated on Ser-240 by CaMK2. Phosphorylated by MAPK3 upon EGF stimulation; which increases transcriptional activity and stability, and is blocked by calmodulin. In response to TGF-beta, ubiquitinated by NEDD4L; which promotes its degradation. Acetylated on Lys-19 by coactivators in response to TGF-beta signaling, which increases transcriptional activity. Isoform short: Acetylation increases DNA binding activity in vitro and enhances its association with target promoters in vivo. Acetylation in the nucleus by EP300 is enhanced by TGF-beta. Cytoplasm. Nucleus. Cytoplasmic and nuclear in the absence of TGF-beta. On TGF-beta stimulation, migrates to the nucleus when complexed with SMAD4. On dephosphorylation by phosphatase PPM1A, released from the SMAD2/SMAD4 complex, and exported out of the nucleus by interaction with RANBP1. Lanes 1 - 3: Merged signal (red and green). Green - ab33875 observed at 52 kDa. Red - loading control, ab9484, observed at 37 kDa. ab33875 was shown to specifically react with Smad2 in wild-type WT HeLa cells as signal was lost in SMAD2 knockout cells. Wild-type and SMAD2 knockout samples were subjected to SDS-PAGE. Ab33875 and ab9484 (Mouse anti-GAPDH loading control) were incubated overnight at 4°C at 1/1000 dilution and 1/20000 dilution respectively. Blots were developed with Goat anti-Rabbit IgG H&L (IRDye® 800CW) preabsorbed ab216773 and Goat anti-Mouse IgG H&L (IRDye® 680RD) preabsorbed ab216776 secondary antibodies at 1/20000 dilution for 1 hour at room temperature before imaging. Immunocytochemistry/Immunofluorescent analysis of HeLa (human cervix adenocarcinoma epithelial) cells labeling Smad2 with ab33875 at a dilution of 1/500. ab150077, an Alexa Fluor® 488 goat anti-rabbit was used at 1/1000 was used as the secondary antibody. Cells were fixed with 4% Paraformaldehyde and permeabilised with 0.1% tritonX-100. Counterstain antibody: ab195889, anti-alpha Tubulin antibody [DM1A] - Microtubule Marker (Alexa Fluor® 594) at 1/200. Secondary antibody only negative control is shown in the bottom panels. Confocal image showing mainly nuclear staining on HeLa cells after the treatment with TGF-b (10ng/mL) for 1 hour. Overlay histogram showing Jurkat cells stained with purified ab33875 (pink line) at a dilution of 1/110. The cells were fixed with 2% PFA. FITC goat anti-rabbit was used at a dilution of 1/150 and rabbit monoclonal IgG was used as the isotype control (green line). Additional bands at: 58 kDa. We are unsure as to the identity of these extra bands. Overlay histogram showing PC3 cells stained with unpurified ab33875 (red line). The cells were fixed with methanol (5 min) and then permeabilized with 0.1% PBS-Tween for 20 min. 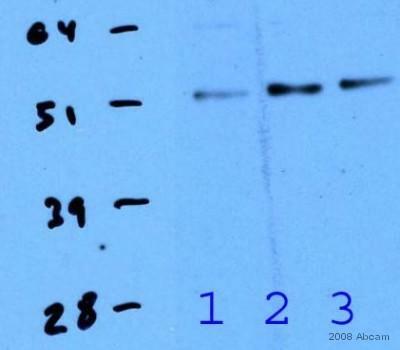 The cells were then incubated in 1x PBS / 10% normal goat serum / 0.3M glycine to block non-specific protein-protein interactions followed by the antibody (ab33875, 1/100 dilution) for 30 min at 22°C. The secondary antibody used was DyLight® 488 goat anti-rabbit IgG (H+L) (ab96899) at 1/500 dilution for 30 min at 22°C. 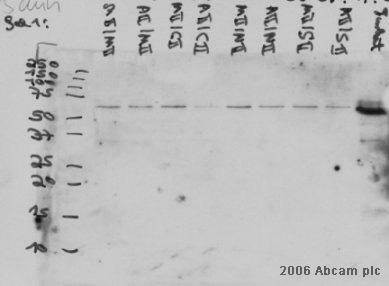 Isotype control antibody (black line) was rabbit monoclonal IgG (1µg/1x106 cells) used under the same conditions. Acquisition of >5,000 events was performed. This antibody gave a decreased signal in PC3 cells fixed with 4% paraformaldehyde (10 min)/permeabilized in 0.1% PBS-Tween used under the same conditions. Publishing research using ab33875? Please let us know so that we can cite the reference in this datasheet. Hello, I'm looking for antibodies that would let me distinguish Smad2 and Smad3 in paraffin sections of mouse heart. What would you recommend? We do have a number of anti-SMAD2 and anti-SMAD3 antibodies which we guarantee in IHC-P on mouse. We to don't have the opportunity to test specific products against one another in each application but based on Abreviews, publications and other data available on our datasheets I can recommend the following products. For identifying both SMAD2 and SMAD3 in IHC-P https://www.abcam.com/Smad2-Smad3-antibody-ab65847.html https://www.abcam.com/Smad2-Smad3-antibody-ab65847.html is guaranteed by our Abpromise in mouse. While we have not tested our SMAD2 products for SMAD3 reactivity or the SMAD3 against SMAD2, I can recommend the following products for identifying the specific proteins based on sequence homologies. For identifying only SMAD2 in IHC-P we recommend the rabbit monoclonal https://www.abcam.com/Smad2-antibody-EP567Y-ab33875.html https://www.abcam.com/Smad2-antibody-EP567Y-ab33875.html. The immunogen used for this product has only a 44.4% identity to SMAD3 Mouse. For identifying only SMAD2 in IHC-P we recommend the rabbit monoclonal https://www.abcam.com/Smad3-antibody-EP568Y-ab40854.html https://www.abcam.com/Smad3-antibody-EP568Y-ab40854.html. The immunogen used for this product has only a 47.4% identity to SMAD2 Mouse.